More so than any other Halo campaign, Reach is a bundle of extremes and contradictions. The scope of Reach’s story is vast, but the battlefields are small. Noble Six’s abilities are scaled down from those of the Master Chief’s, but he is then given vastly superior weapons and equipment. A meticulously balanced weapon sandbox is undercut by a handful of very poor design choices. Reach’s missions are bursting with homages to the first Halo game, while simultaneously including sequences diametrically opposed to its design principles. And while Reach is the most artistically accomplished Halo title to date, many core aspects of the game feature a surprising lack of polish. It all adds up to a tough package to evaluate. Reviewing a game as complex as Reach in depth, and giving every aspect its due is beyond the scope of this effort. In order to dive deep into some key aspects of the game, we’re going to narrow the focus down to two overarching aspects of Reach’s Campaign: the gameplay design, and the missions in which that gameplay is set. We’ll largely eschew the story — which itself deserves a deeper look — except when the narrative context shapes mission design. We’ll begin with the mix of weapons, enemies, capabilities and vehicles that form the combat sandbox, and then turn to the mission and encounter designs themselves, and see how well the two mesh. Bungie gradually scaled up the Master Chief’s abilities as the Halo trilogy progressed, to the point where he was leaping into, over and otherwise plowing through Brute packs in the final chapter, single-handedly taking on larger and larger enemy encounters. With ODST and Reach, the characters were brought down to earth, literally. The Spartan IIIs of Noble Team are the lesser of their Spartan II brethren in in Halo canon, which is reflected in Noble Six’s base traits. In Reach, we leap a little lower, walk a little slower and feature shields that recharge more gradually. These base abilities fall about midway between the Chief and the Rookie from ODST. A deceptively simple key to Halo’s success is the way the games are fun to play before we even do any fighting. Many of the most memorable moments in the series don’t involve any combat at all: leaping and climbing through the expanses of a beautiful, alien environment or drifting about in a Warthog over rolling hills and icy fields. Jumps are joyfully long and floaty. Grenade mechanics are tuned so we can place a satisfying explosion exactly where we want to, while the weapons have heft and impact. Halo has never been a fast game, but Bungie tuned the Chief to be agile, responsive and fun to control. While much of this feel is retained, there is an unwelcome heaviness to the Spartan IIIs in Reach. The jumps aren’t just lower, they’re less floaty, as gravity pulls us down faster than before. Beyond not being as fun to leap around, it makes us less functional because the environments are more difficult to maneuver through. Strafing reveals significant player inertia, a first in the series, which prevents quick changes in direction. It makes Noble Six feel heftier and more solid than the Chief, but also less agile. Avoiding a plasma grenade is much harder when we can’t change directions quickly or leap as far or as fast, melee combat is clunkier and the lower jump height limits our maneuvering options. The reduced movement speed is not an issue in isolation, but when combined with the inertia and lower jumping abilities, it makes CQC more dangerous. It adds motivation to be more selective in CQC scenarios, generally pushing combat distances out further, because to close ranks is to take greater risk. Beyond base traits, Reach has added a layer of nuance to many player actions that impact our abilities. While primarily tuned for multiplayer, they do have a marginal impact on Campaign. Bringing back fall damage and health packs are two examples. Few leaps in the missions cannot be survived by crouching to offset the fall damage, at a cost of a momentary stun, while health packs are frequent enough to warrant only the occasional backtracking to seek one out. The effect of both is a moderation in the pace at which we advance through the levels. 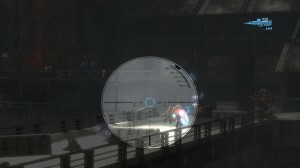 The bloom mechanic added to precision weapons was tuned for Multiplayer, to differentiate players who have mastered ideal firing cadences from those who have not. But without other players returning fire, there is both less pressure to fire faster than is ideal and less consequence for doing so. As such, bloom is largely a non-factor in Campaign play. Bloom has much more impact in Multiplayer than Campaign. 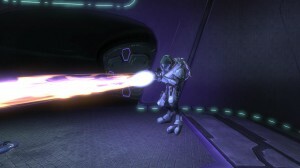 Among the gameplay updates in Reach, Armor Abilities have the largest impact to the Campaign. While a few of them enable us to tinker around the edges of how encounters play out, such as armor locking to avoid the odd Wraith mortar, most do not facilitate radically different combat tactics compared to equipment in Halo 3. From the outset, they, like reticule bloom, seem to have been designed with changing up Multiplayer in mind. Sprint and jetpack are another story entirely — one we’ll tell shortly in order to put them in a proper context. Halo’s armory had accumulated as the trilogy progressed, to the point where it was bulging at the seams in Halo 3. There was an elegance to the minimal overlap among weapons in the first Halo title. Each UNSC weapon filled a distinct, instantly recognizable role: the shotgun, the sniper rifle, the machine gun and so on. The few Covenant weapons were all appropriately alien in design and held unique properties, such as the Needler’s graceful pink shards of explosive death. Then Halo 2’s split narrative brought parallel weapon designs, introducing Covenant analogues to UNSC weapons so that the Arbiter could have a similar arsenal as the Master Chief. This led to weapons such as the Carbine and Beam Rifle, overlapping with the Battle Rifle and Sniper Rifle, respectively. Halo 3 continued the weapon accumulation, and the end result was a vast array of guns that had become duplicative, the distinctions between the Spiker, SMG, Assault Rifle and Plasma Rifle matters of nuance. With Reach, Bungie has taken the opportunity to reset the weapon sandbox. They did this in three ways, all toward the goal of making each weapon fill a more clearly defined role. First, they pared back redundant weapons by removing the SMG, Mauler and the grenades added in Halo 3, among others. New weapons were slotted in, each with distinctive properties, such as the Plasma Launcher. Finally, and most importantly, many weapons have been re-imagined to take on more distinct roles. Because the Covenant need to be able to engage us from the same ranges we engage them, the total elimination of duplication is impossible. Bungie tackled duplication by infusing the Covie-flavored UNSC equivalents with unique properties. This led to the Carbine gaining the Needler’ supercombine effect, and the Beam Rifle blending with the Sentinel Beam’s steadily damaging beam to become the Focus Rifle. A more fair, unique enemy sniper rifle. This last change also had the effect of making Covenant snipers fairer to the player by preventing instant-kill headshots from out of nowhere, a problem that plagued Halo 2 and to a lesser degree Halo 3. A key tenant of Halo campaign design has been to provide Covenant weapons with a travel time, which allows us to dodge incoming fire. The Beam Rifle violated that, and while the Focus Rifle has an instant travel time, the extended kill time compensates. Weapons that didn’t morph into new ones were refined to become more useful. Of note, the Plasma Pistol, Spiker, Assault Rifle, Magnum and Plasma Rifle all got significant overhauls, making each more capable as standalone weapons than past outings. The Plasma Pistol now packs a punch it hasn’t had since the first Halo, and it’s useful for more than simply stripping Elite’s shields and overcharging vehicles. The net effect is to make more weapons viable in more situations. One weapon that doesn’t quite fit in is the Magnum. Designed as an alternate starting weapon and close-range counter to the DMR in Multiplayer, its lesser range, capacity and accuracy mean it struggles to find a role once a rifle is introduced to a Campaign mission. The Magnum is only deployed in a handful of mission starts when the designers want to limit our engagement range (or as a side arm to compliment the Sniper Rifle in Nightfall), but in most cases a DMR is deployed shortly thereafter anyways, rendering it redundant. And even if we wanted to stick with it, spare ammo is not provided once the DMR or Needle Rifle is introduced. Once the DMR is introduced to a mission, there's no role for the Magnum – or most other weapons. Despite the Magnum’s redundancy, Reach features an array of weapons almost as large as Halo 3’s, with each tool nearly as distinct as the sparse Halo: CE set. It is the most diverse and useful weapon sandbox in the series, which is a formidable accomplishment. Just as importantly, the weapons are not just useful but also fun to use. Halo 1’s Assault Rifle was enjoyable to use even in battles where it was wildly inappropriate, thanks to the powerful feedback it provided. That deep throated rumble, the flaring muzzle and the sheer volume of bullets spat made it a satisfying and visceral weapon to use. With Reach, nearly all of the weapons feel as good. The sound design is harder edged and has more impact than before, and each weapon has unique audio signatures. The crack of the DMR is powerful; the whizzing needles of the Needle Rifle instantly recognizable. Weapon animations are detailed and diverse, with alternate priming and reloading sequences to add visual variety. It’s important to stress how good the gunplay is and how much enjoyment is found within it, because when good gunplay is transported into poor or repetitive mission designs, the missions can still be fun by virtue of the core game mechanics (see: The Library). When the combat is fun, we can focus on the moment-to-moment gameplay, which trumps all else. However, not all is perfect in the weapon arsenal. The new go-to weapon, the Designated Marksman Rifle, is distinguished from the Battle Rifle it replaces by its increased effective range and precision. While satisfying to use, it ultimately has a highly detrimental impact on the quality of the Campaign, pushing out encounter distances to the point where much of the rest of the sandbox becomes excluded. The impact is significant enough that we’ll revisit it in detail when we turn to looking at the designs of the missions. The “golden tripod” of Halo’s combat mechanics are well-established — guns, grenades, melee — but there is an additional principle underlying it all: clarity. Every weapon effect and UI element has been crafted to make the action easy to see and understand. Overwhelming our senses for the sake of creating a stylistic effect has never been a part of Halo. Directional damage indicators point us to where enemy fire is coming from, while keeping the screen clear, not obliterating it in raspberry jam. When a weapon is scoped, the screen is not filled with the ghastly, vision-occluding iron sights. Quite the opposite: The screen is simplified to show a clean view of the battlefield. Even the foliage height and density is tuned to make sure we can always find dropped weapons and grenades. Some weapon effects in Reach are so amped up, they violate the principle of combat clarity. Grenades, which now blow out the game audio when they explode near us, take away a critical aspect of our senses. The effect adds to the chaos at great expense, as incoming grenades and fire go undetected for a few, often costly, moments. It’s an entirely unwelcome addition to Halo. Someone, somewhere, has a Fuel Rod Gun. 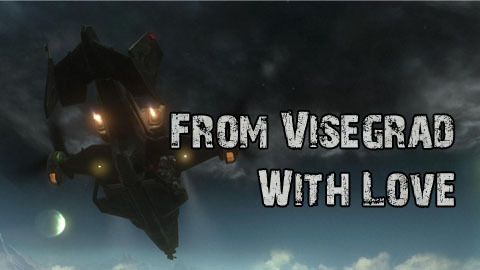 While most weapons in Reach received a welcome boost in their visual and audio effects, two have been juiced up to the point where they make it hard to tell what’s happening when they enter the fray. The Fuel Rod Gun lets off a world-ending cacophony of chaos when fired anywhere near the player, with screen-consuming lighting, sound dampening explosions, thick smoke and a screen-shaking effect. It gets to the point where an FRG round impact signals that someone, somewhere, has an FRG, and we’re probably going to die soon because we can’t tell where the heck the fire is coming from. Even when using the FRG, the explosions are so large and dense it’s hard to tell whether they were on target; it’s not uncommon to fire off a volley only to find a plasma grenade attached to our face when the smoke clears. The Concussion Rifle’s effects are similarly over the top, but the damage is oddly inconsistent; it’s a devastating weapon when used by the Covenant, with a stun effect that often prevents us from avoiding follow-up rounds, leading to cheap deaths. But using it against the Covenant just sort of knocks them around a bit. These weapons are missteps, but they don’t offset the newly revamped weapon arsenal, which is as diverse and high-impact as any in the series. Overall, Reach’s gunplay is superb, which is a good thing because there are a lot of problems it needs to — and largely does — compensate for. Woah….. there’s a lot of thought in there – I’d never really thought about how the change to DMR really changed up the play from H3/ODST to Reach – I think it’s a sign of a great game where most players would not have noticed this variable change – at least in their first run through. I shared much of these thoughts myself, but as Leviathan has already said, you pulled much more out of it than I managed to. I really wanted to love Reach, but these rough edges that you touched upon, combined with the loss of signature Halo music (which was much more of Halo than I thought, because I missed it constantly) really hampered it for me. I still think of Halo 3 when I think of the Halo series in general. It’s like you took the most wonderfully high level of vocabulary I don’t have and used it to write out exactly how I felt when playing every bit of Reach. Bravo, sir. This surely was a pleasure to read through. Being able to put words to how Reach makes me feel is a powerful thing. I liked the Magnum’s roll in campaign. During LASO challenge runs, I’d use it up whenever it was available over using the DMR. Gotta save that precious DMR ammo for the long range encounters. As you know, prepping for LASO or any other high difficulty is an important part of the game plan. If the Magnum is in limited supply during the easier difficulty settings, is that really a problem? Perhaps it’s all part of a required redundancy to accommodate the variety of difficulty settings. I think I prefer the Halo 3 Hornet over the REACH Falcon. I believe it filled campaign and multiplayer roles better. I know your document is about campaign but the inability for the Falcon to carry objective holding passengers in multiplayer has me ticked off at it. Regarding the Chopper. You said “a shadow of the Chopper where the gulf between a skilled and unskilled pilot was vast”. I feel you let multiplayer capabilities creep into the discussion here. I doubt driver skill level plays a serious role for either of these two vehicles in campaign. They both have a fairly good stand off capability in campaign though I’m quite sure the Chopper had greater range with easier aiming than the Revenant has. That would make it easier for unskilled pilots to use in campaign. As for multiplayer, I think the story is reversed. Regarding vehicle health decoupling. I am okay with vehicle strength being completely independent from personal health. I also believe occupants with any shields and full health should survive the exploding vehicle. While playing campaign, this situation was never a problem for me. It is a bigger problem in multiplayer. I am very impressed with your inclusion of video examples. Absolutely spot on. Many issues in this article are ones which I picked up myself but couldn’t seem to fathom [i]how[/i] it was an issue, something which you have enlightened to me now. I have to agree with HSAR’s opinion of Halo 3 being the monument of Haloness. 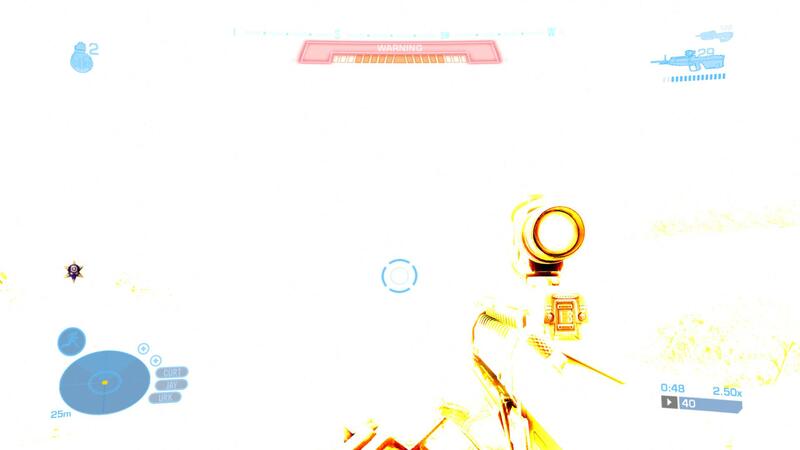 I think we will see these issues much more clearly when Halo:CEA is released. Thanks for writing such a brilliantly thought out article. Regarding the Crow’s Nest, hallway and Brute encounter. I always used the same approach with the BR as I now do with the DMR. Whittle away the shields or armour with lesser weapons and then headshot them with the BR. There was a perfect yet narrow range for this combat to occur. So I guess I disagree with your opinion on the BR vs DMR in some situations even though I agree the DMR has a greater effective range. One thing that must be considered is, the statistical information the developer has acquired from previous titles. I.E. They know how many people have completed the campaign and on what difficulties. Some of the design decisions you are unhappy with may have been the result of an effort to attract more players into playing further into the game and at greater difficulty settings. If successful, the game could become more satisfying to a larger player base. The side effect of such efforts is the loss of the game’s long standing veterans. Perhaps such losses are inconsequential when it comes to selling games and dare I say, ‘beneficial’. Sorry for the multiple posts. I am not sure when I’ll stop reading the article and when I might get back to it. So I am reading a bit and posting a bit. The space flight sections were what I enjoyed the least. Like so many flight/space battles, you wind up chasing pixels. Specks of information on the screen which you target and destroy. The enemy is rarely close and the narrow POV makes for either extremely difficult or very easy combat. Once I learned to hide behind the main station structure or behind the Savannah later on, the battles became boring while praying not to get killed on the higher difficulty settings. I simply endured the situation. I was skimming at the end because it was so extensive and my attention span had expired. Perhaps you should have released this in segments starting months ago. Great write up GhaleonEB. I’ll bet a couple of developers, who are near and dear to us, are going read this very carefully. Much of what’ve you said, I agree with. It’s a superb analysis. There is one bit though, which disappointed me more than any other facet of Reach’s design, and that’s the story. In the FoR novel, there are incredible opportunities to create the greatest Halo campaign of all time. Almost all were ignored. We get no true sense of grandeur, or epicness, save for the truly brilliant New Alexandria mission. Noble’s Spartans are very poorly utilised, as you pointed out. The game failed for me, spectacularly, and was almost insultingly easy to complete on Legendary. Only the Halo 2 campaign failed worse than this, in my opinion. If I want to remember Halo ten years from now, I’ll play Halos 1, 3 and ODST…and Reach will lie forgotten. I hope 343i take head of your comments about friendly AI and your comments about their driving. If 343i can’t fix friendly driving then don’t have them drive unless they have been told to drive via script. Or… there are plenty of spare buttons and axes available when you are a hog gunner for giving the driver instructions (stop/go, directions) and for fast position switches that wouldn’t even require dismounting. We should have Warthogs in Halo 4 but will we have friendlies? You can ditch Jorge in the spire encounter – equip jetpack and drive one of the trucks. Jorge will take his gunner position and then you can drive the truck over the cliff. Jorge will have no hard feelings about it and will give you encouraging comments from time to time from his position at the base of the cliff. You will find it easier to board a Banshee without Jorge shooting both craft out of the skies. I disagree on multiple points. The biggest one has to be saying that Combat Evolved had a rafined combat. Once the Magnum was introduced, all of the levels became a walk in the park. The only moderately difficult level was Truth and Reconciliation, and that was because it had no Magnum. That Pistol, like the DMR, lead fight on long ranges where enemies did not stand a chance, and it was, honestly, the best weapon for all enemies and ammo for it was abundant. Another thing I disagree is on weapon “babysitting”. Combat Evolved did have that…in massive amounts. Take Assault on the Control Room, once you get outside you have a Sniper and Rocket. Ok? You are basically set for the rest of the level. There is ammo in the first area you find them, then there’s ammo in the next area near the Scorpion (another tool that makes the level a cake walk), then you have ammo inside the cave, once outside you have, yet again ammo near the pillar structure in the next canyon. Once you go through there, you have ammo again after you defeat the hunters. Another thing is that massive battles are seldom avoided by the use of active camo, which is found in lots of convenient places. The camo in AotCR is found in the big pillar, and it gives you enough time to make it to another one where the Marines are pinned down by the Hunters, and that ones allows you to run from a massive army. The saddest thing is that, without that camo, you could have actually helped the marines which were pinned down from the Shades, but no. Another one is found in the invis elite room, and allows you to walk outside in the Control Room canyon and jack a Banshee and end the level…? All you need is to replay the level and you are set. Like you said in some cases in Reach, you can diversify the combat, but you are risking by not accepting the easier way out. That is true in the encounter I mentioned earlier. Why fight your way to the pyramid when you can just jack the Banshee and skip? Another thing that i disagree is the Marine/Noble team friendly AI. Noble team needs to be the meat shields, the NPCs that kill few enemies, since they are pretty much invincible, they are automatically overpowered. If you have enough patience, you ca let them do everything, yet it takes a long time. That’s the general concept of not making hard difficulties easier by aid of invincible allies. As for Marines, they will generally do a good job at shooting, I mean you can play easy normal, and see that they do a pretty good job, the only thing they really don not do well is driving, i agree on this. Their driving is horrible. But aside from that, as in previous Halos, arming them with better weapons will give you a great advantage. In ONI, i got Kat on the Gauss turret, and a rocket marine in the side seat. They tore through everything, yet you still had to drive them well. The Hog is a teamwork vehicles, be it in MM or Campaign, bot the driver and gunner need to do something. If you just drive the Hog close, stop and expect the AI to kill everything, the enemy will take advantage of that. You need to navigate the vehicle so that the gunner has a chance to shoot, while the enemy has a hard time to react. Yet another thing is the vehicles, they do “seems” to have a random explosion pattern, but it is not the case once you start to learn them. Revys and Wraiths can take a beating and will not explode even when smoking. Ghosts and Warthogs will once the vehicle’s body begins to degrade and when fire/smoke rises from it. In that case, the solutions are to either abandon it or to driver through and maneuver is such a way as to not get shot. Elementary. And the Revenant has a pretty big role. It’s the medium assault vehicles between the overpowered wraith and underpowered Ghost. It fills in the gap of defending medium sized area with moderate firepower, and somewhat resembles the Prowler by the added passenger. Spectacular write up, but I’m going to disagree with your analysis of Lone Wolf. It just seemed tacked on to me, like Bungie said ‘whoops, we forgot to kill off Noble 6, let’s just throw him up against some enemies in an unwinnable situation’. I would have preferred that Noble 6 die at the end of PoA, perhaps sacrificing himself somehow so the PoA could safely escape. This could have even mirrored Jorge’s death, ie, someone has to stay behind to arm the bomb. Otherwise I just felt that Lone Wolf was a rather lazy way to have Noble 6 die off, and not even in an honorable or inspiring way.